The Persian Cat, a sweet tempered and beautiful companion. The CFA accepts the Persian cat in seven divisions: solid color, silver and golden, shaded and smoke, tabby, parti-color, bicolor and Himalayan. This cat's luxurious coat does not react well to neglect. It can mat and will tangle easily if not properly groomed. Prospective Persian owners should be aware that this breed requires daily grooming. Bathing and grooming should be gently performed because this breed is sensitive. Persians are sweet and easygoing, with a friendly personality which is only one reason why the Persian is popular. A cat of this breed makes a sweet addition to any family. 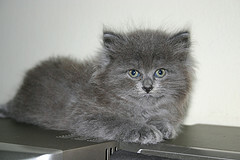 For a beautiful, loving pet, the Persian kitten is a good choice. It's no wonder that these easy going felines are widely considered to be the most popular breed of cat in the world. Short, heavily boned legs and a rather boxy, stout body. 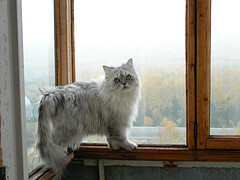 The Persian cat's head should be round, with a short, snub nose and large, round, expressive eyes. The majestic Persian is a large cat, with a long, flowing coat of richly textured, silky soft fur. Loving and dedicated companion cats, persians are a fine family pet, and enjoy the close relationships they form with their humans. Whether kept as a personal companion or pampered show cat, the Persian will not disappoint either in personality or beauty.